Ooey, gooey, chocolate-y and rich, there are few better camping desserts than a good old-fashioned s'more. But, for the health conscious camper, it may not be the best fireside snack option. However, no one should go without this camping staple, so instead of nixing it altogether, you just have to reinvent it. - Sandwich base: Usually a graham cracker, sometimes plain, sometimes dusted with cinnamon and sugar. - Creamy stuffing: Puffy, sweet and irresistibly light, there are very few substitutions for a marshmallow, one of the most integral ingredients. - Chocolate: Once placed in the sandwich with your freshly toasted marshmallow, it melts into the creamiest chocolate chunk you've ever enjoyed. So, how do you take this classic combo and turn it into a healthy treat? Let's take a look at each ingredient. Normally you'd use graham crackers, however, this aspect of your s'more is very flexible and can be made healthy with a simple switch. What are some of your options? - Homemade cookies: Make your own batch of cookies before the trip, and use those. This gives you ultimate control of the ingredients and nutritional value. - Granola bar: Choose your favorite granola bar, and split it in half. Denser than a cracker, this will keep you full longer. - Another option is to eliminate one of the crackers for an open-face s'more; this method may be messier, but eliminates some of the calories and sugar. Marshmallow is the toughest ingredient to substitute without changing the flavor entirely. However, the options available will add more flavors, making it even better than the original. - Peanut butter: Get a jar of flavored peanut butter to make this even tastier. Though it may not be lower in calories, depending on how much you use, you'll be indulging in a healthy fat while your body benefits from a good dose of protein. 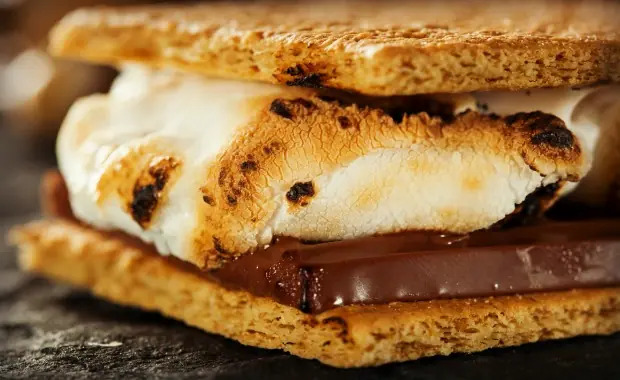 - Make your own: There are a variety of marshmallow recipes available—Epicurious.com has a few you can try—all of which make a great substitution. While this will require extra preparation, you'll feel better digging into this treat. - Low-fat cream cheese: Again, the flavor will change a bit with this substitution. However, with less calories, and more nutrients, such as potassium, calcium and vitamin C, you'll get more bang for your nutritional buck. This is the easiest substitution, and is more delicious as well. Choosing dark chocolate—60 percent or higher—will have less fat and more healthy antioxidants. Use one small piece as opposed to a whole square to cut back even more. Finally, extras will make your healthy s'more more nutritious and irresistible. For the best flavors, consider fruit such as strawberries or bananas, which will pair well with melted chocolate. You can also sprinkle in a pinch of plain coconut flakes or crushed nuts. S'mores are a staple of camping, and no healthy eater should be deprived of this classic toasted dessert. Make the right substitutions and you'll enjoy a healthy twist on an already delicious camping dessert.